Pay off your debts as soon as possible. Ideally, you'll want to get rid of bills that charge the highest interest rates first. Consolidate debt into a low rate Personal Loan. Finex is currently offerring rates as low as 1.99% APR*! But as long as you're eliminating debt, you're taking steps to increase your credit score. You can use loan calculators to figure out how long it will take to pay off your debts. Check your credit reports. 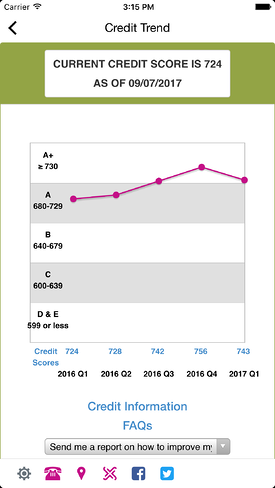 Visit Annualcreditreport.com to get a free copy of your credit report from each of the three major bureaus — Equifax, Experian and TransUnion — once every 12 months. You'll want to make sure there aren't any errors or other problems in your records. If you find a mistake, alert the reporting bureau about it and ask for a correction. It would also be a good idea to send the same message to the lender that provided the information. Fixing errors can take months, but keep in mind that if you don't ask for corrections, no one else will. So do your part to make sure your records are 100% accurate. Monitor your score with CreditTrend available through the new Finex Mobile App. Sign up for Credit Protection Plus through Finex Credit Union. Your credit score is an important factor when it comes to being able to borrow money. Finex credit union works with our members to educate you on credit scores and their impact. Wednesday, March 28 at our East Hartford Branch from 5:30pm - 7pm! There will be Door Prizes, Mortgage Advice, Appetizers and more! Each guest leaves with a Personalized Credit Score Enhancement Package! RSVP by March 26, 2018.